Last night was the grand opening of a new novelty restaurant, The Sugar Factory on Ocean Drive in South Beach. 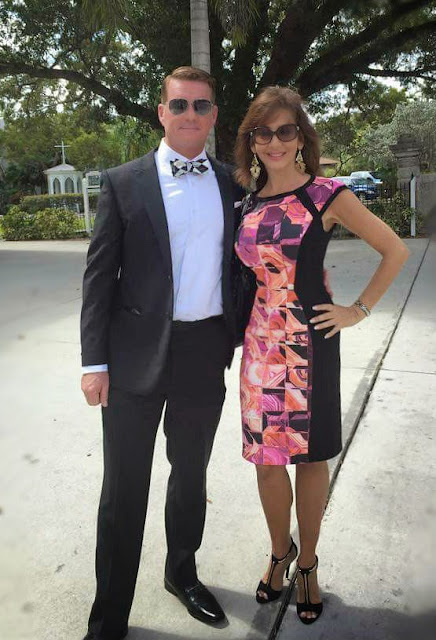 As a local business owner who frequents these restaurants/bars for my popular cocktail tour, I was invited to attend the festivities. I attended with my lead tour guide James Cubby, who is also a writer for various tourist related magazines. The Sugar Factory, as the name denotes, screams sugar and sweets. And they know how to pop! From the shiny colored pearl gumballs, to the bedazzled shelves and yellow rubber ducks, bright and eye-catching are understatements. But the main attraction tonight was reality celebrity, Kylie Jenner, daughter of Bruce-now-Caitlyn Jenner. Apparently the Kardashian/Jenner families are big supporters and fans of the chain. I watch very little television and I have never watched the Kardashian reality TV series but I catch updates on news and late night comedy shows given their pervasive stratospheric celebrity status. After our red carpet pose, (click here for Grand Opening highlights) and mingling with other VIP guests, to relieve our hunger pangs, James and I escaped the paparazzi and swarm of teenagers (there to photograph the celebrity invitee, Kylie Jenner) to the restaurant. We entered from the hotel lobby. To the right was the main entrance of Sugar Factory. A signature candy are the embellished couture pops with a "green" angle. 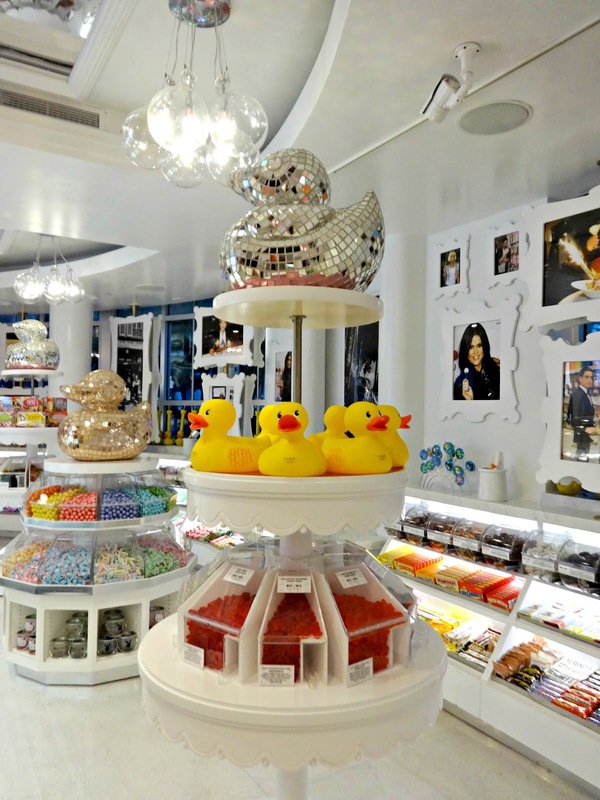 Sugar Factory's Couture Pops have a reusable, plastic bedazzled stick and sucker-saving plastic top. At first I frowned then I turn to spot my bedazzled calculator even diamond covered measuring tape. I suppose I will need that couture lollipop stick after all! It's actually brilliant idea combining a simple candy to an adorned holder, like the waffle cone for the ice cream. But this is flashy, a true accessory. Soon I learned why there are images of the Kardashian sisters throughout the candy store. They have endorsed and launched several Sugar Factory store openings. 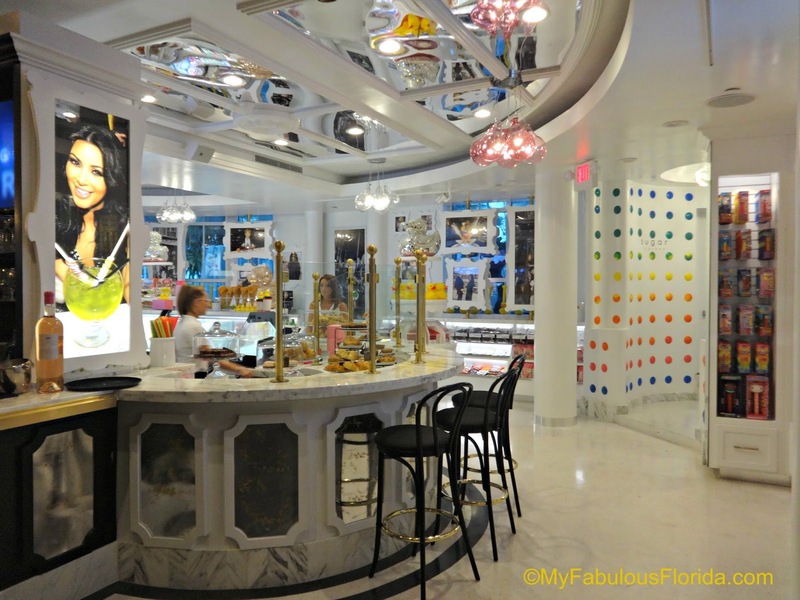 Sugar Factory’s Couture Pops have become a celebrity favorite since their conception in 2009. Pop stars such as Britney Spears, Eva Longoria, Katy Perry, Rihanna, Drake and more have been spotted throughout the years with the candy company’s famous lollipops. 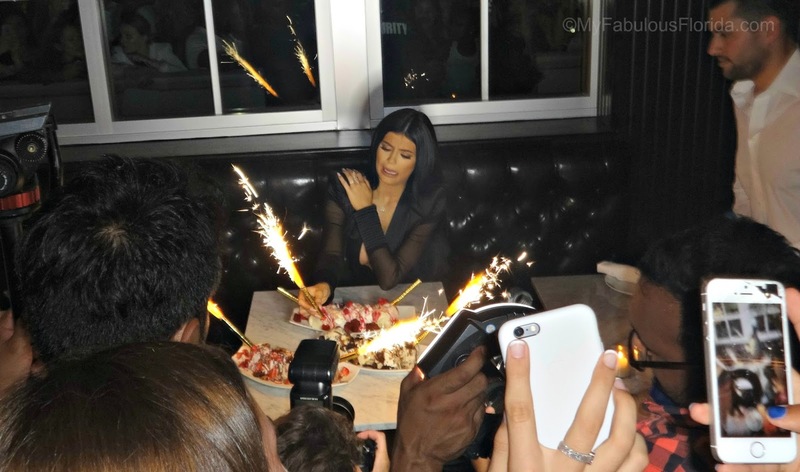 As we're dining in the restaurant, the screams heightened as Kylie Jenner entered and made her rounds through the candy section and settled at a nearby booth. A tender 17 year old, and a natural beauty without makeup, Kylie looked like a mini Kim, the hair, makeup and the revealing dress. Kim wore a similar fitting décolleté suit on the Jimmy Kimmel show. I wish I could whisper to her to expand her wings and flex her creative muscles and develop her own style. The dessert sampling was awkward all the way around. 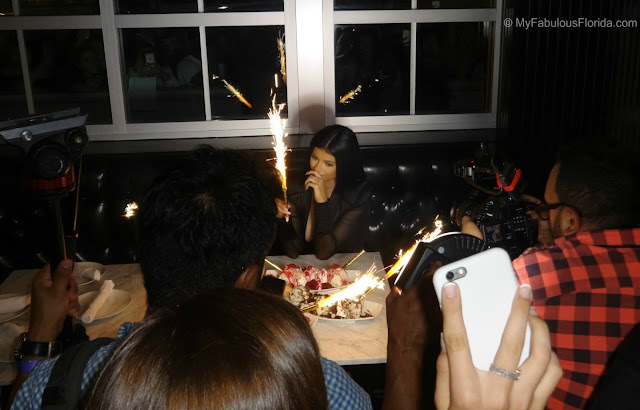 From her "I can't believe I'm doing this" pout expression while holding a sizzler, to her one arm constantly covering her right breast, you wondered if this was her first time wearing a revealing dress of if she feared a malfunction. "Own it Kylie!" Once the sampling was over, she perked up and photobombed a girl's selfie. Shrieks erupted. 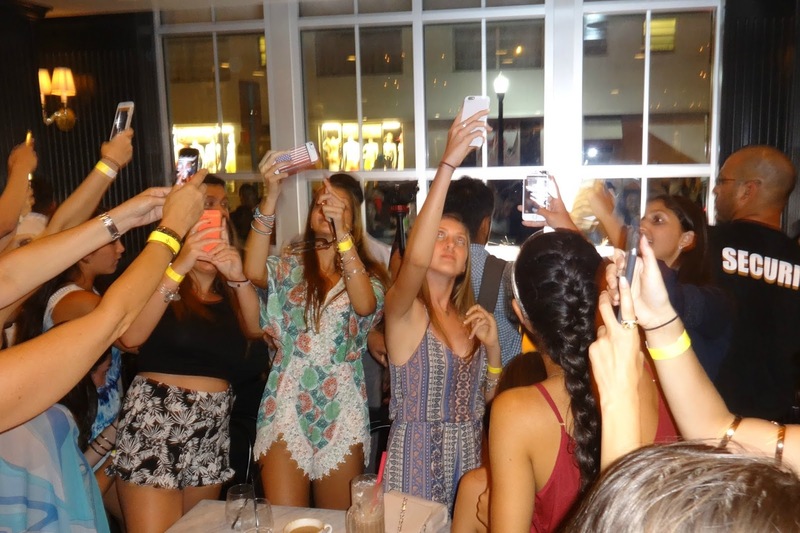 Fans turn around and take selfies with Kylie seated behind them. James and I were more fascinated watching and photographing these teenagers scrambling and angling to get a photo of Kylie. Their smiles, giggles, expressions... I hope they would do the same for a smart, independently successful famous woman as well. After our dinner, we tried to leave and were trapped. At every exit the security guard sent us to another exit only to have the next security guard tell us the same thing. Finally I insisted they pick a door to let us out. The doors opened and hundreds of faces with arms and cell phones extended clicking away. It was surreal. Instead of paper and pen extended for autographs it's all about the photo, and the possible selfie. The security guard cleared a path for us. My gosh. I actually thanked God that I was not famous. My freedom and privacy are golden. Another year gone by and another BlogPaws pet conference (related to my nonprofit for pets and blogging efforts). 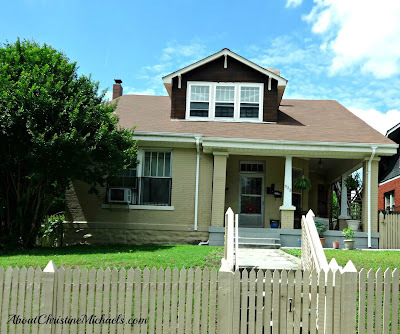 This year it was held in Nashville, TN. I have to say I felt like a kid going to Disney World for the first time and I had no idea why I was so excited. But then I realized this trip had all the ingredients of my favorite things-- seeing all my online pet blogging friends (we communicate year round online); attending seminars to learn new tips and techniques to improve my writing/blogging efforts; and getting to explore a new city and culture AND taking someone else's tour; a reason to go shopping; AND a reason to get into character (wear cowboy hat and boots). 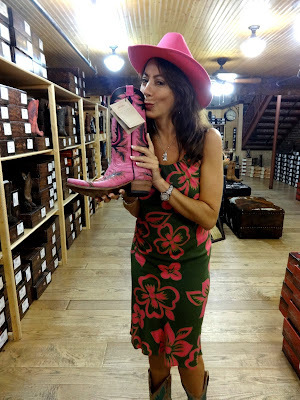 I love costumes and dressing up; there's something alluring about the cowboy theme--all Americana, ruggedly handsome men, songs where you can understand the lyrics, polite people...! Yes this was a great trip and a bigger surprise was in store for me towards the end! As I paraded through the Miami airport, heads were turning. 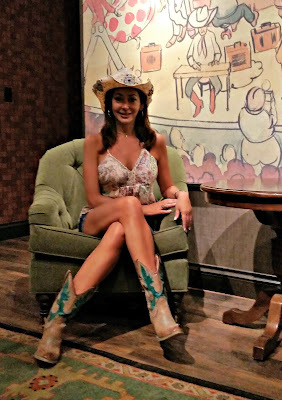 Purely for my pronounced outfit--my cowboy hat and boots were screaming "country". Homeland security officers along the walkway asked me if I were going to Texas. I said "No the other "T"--Tennessee, Nashville". "Aah yes", they nodded. As a marketing lover, Branding is my favorite role. 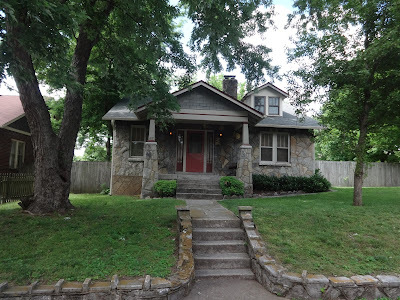 From the airplane on our descent into Nashville, immediately I noticed the rolling green hills, manicured lawns, and friendly smiles. 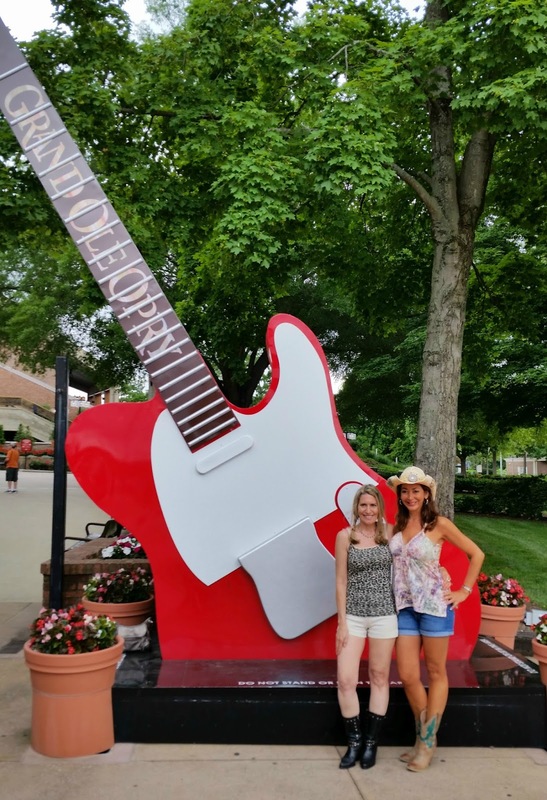 Nashville oozes southern hospitality and charm and also carries a celebrity vibe given that it's home to Opryland, the greatest country singers. 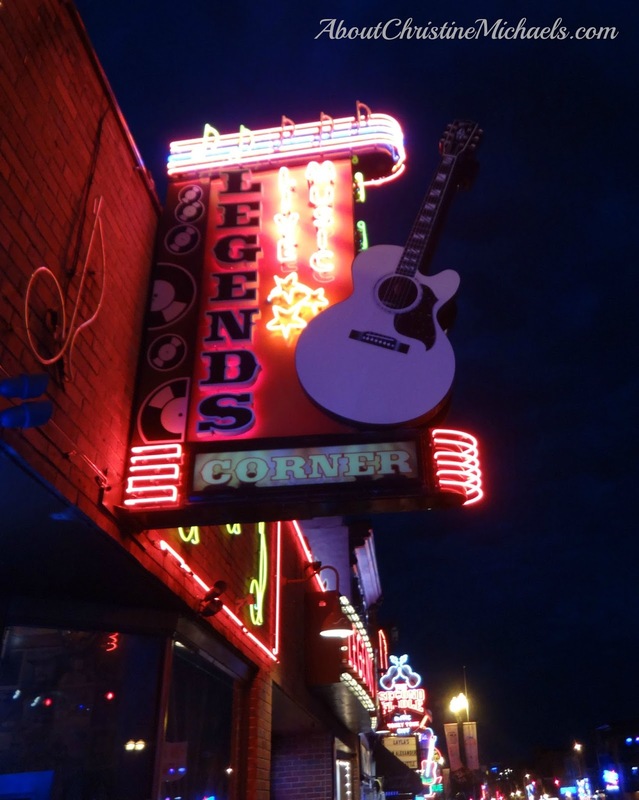 The ABC television series, "Nashville" is also filmed in the namesake city. As a fan of the ABC TV series Nashville, I've come to learn a lot about the culture of the city. 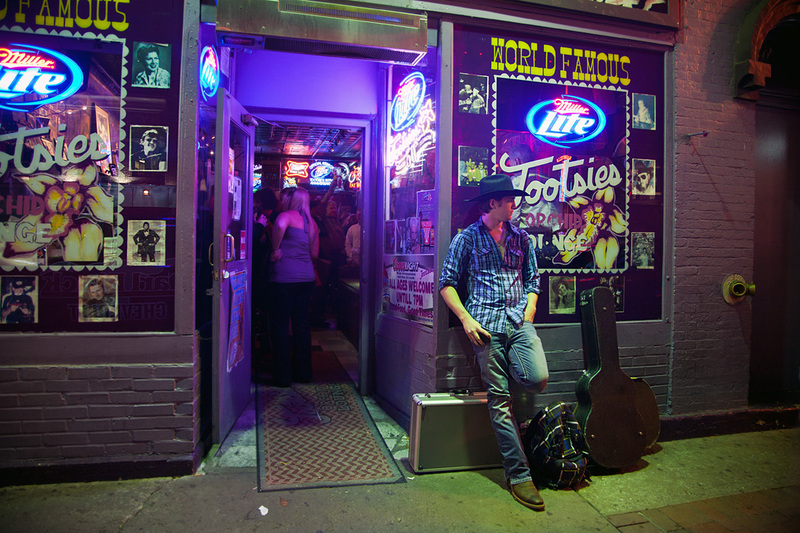 Country music is the heart and soul of Nashville. No bones about it! On Thursday afternoon, a couple of blogging friends from the conference and I signed up for the bus tour of sites filmed for the TV series. Unfortunately the Ryman auditorium was closed but we visited the "homes" of characters like Scarlett, Will and Deacon. The homes are privately owned and rented to ABC studios during filming season from November to April. Production costs are therefore higher and I was surprised to learn that Connie Britton only makes $100,000 per episode. 99% of the tour was on the bus so picture taking through the bus windows was not ideal. The buses are not permitted to stop and unload. With so many stops, it makes sense. 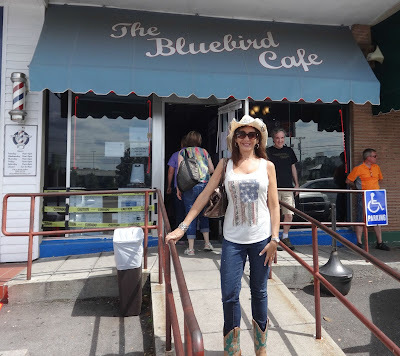 However, we were permitted to go and sit inside the original Bluebird Cafe. 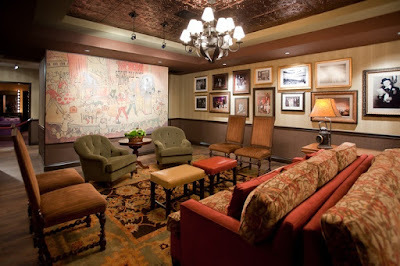 It was here that one true life artist was discovered after he was rejected more times than a guitar has strings. His name is Garth Brooks. Another artist, Taylor Swift also caught her break at the Bluebird. The cafe is so popular and packed each night that ABC had to recreate it in a studio. According to the long-time manager the stage crew took the tables clothes, napkins and other objects for an authentic replication. After our Nashville tour, I could not wait to visit the Grand Ole Opry. 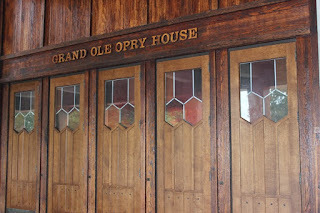 The Grand Ole Opry is a temple for recognizing, honoring and celebrating the best country music singers. 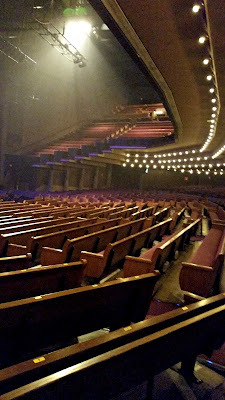 Prior to its current location, the "Mother Church" was located at the Ryman Theater in 1943 which also housed other events and productions. 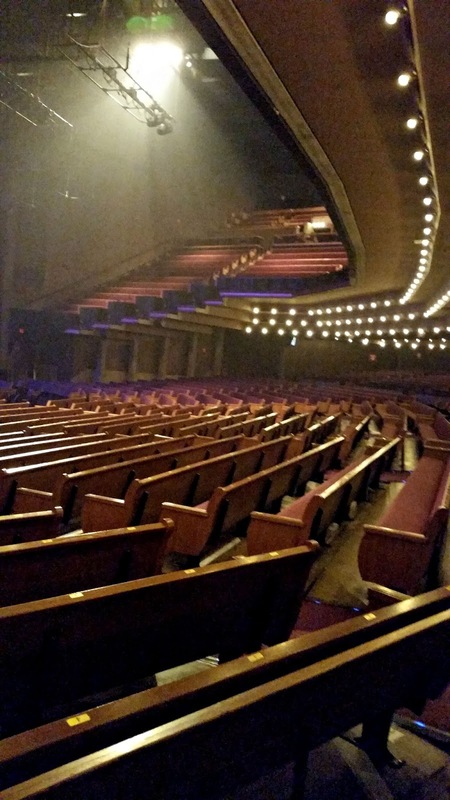 The Ryman was home until 1974 when a new stage was built right outside of Nashville in the themed Opryland where hotels, outlet mall and restaurants exude the Opry spirit. 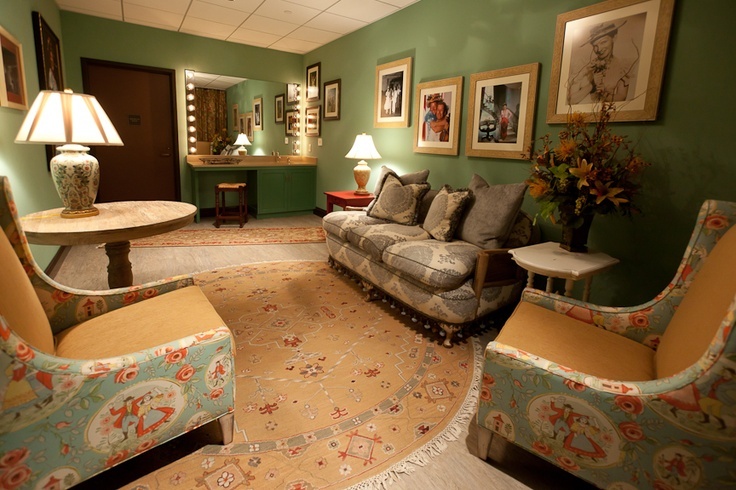 While there are 19 numbered rooms, there are physical only 18 dressing rooms. The number 13 was skipped for superstition. "Ready for my performance! Too bad I can not sing. But I can line dance!" In an effort to maintain continuity with the Opry's storied past, a large circle was cut from the floor of the Ryman stage and inlaid into the center of the new Opry stage. During our tour we stood on the stage and the circle. 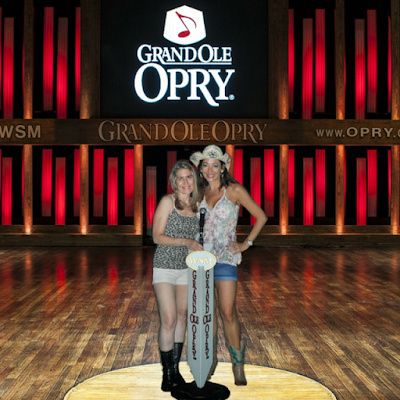 I almost expected a lightning bolt to zap me for standing on that hallowed circle given my lack of singing ability. 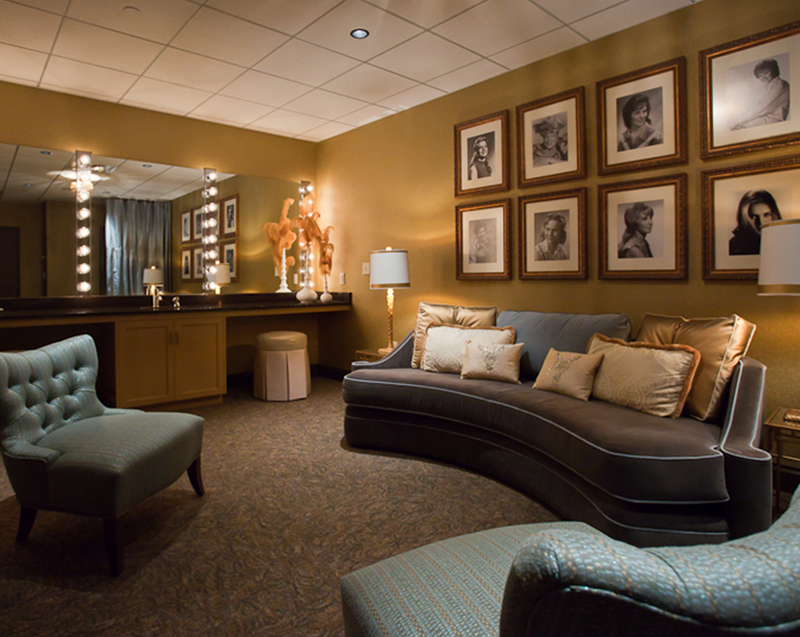 Sadly a devastating flood in Nashville in 2010 caused massive damage to the Grand Ole Opry including the stage. Miraculously, the circle was untouched. The circle was not broken. It was lovingly preserved during the round-the-clock renovations. Having performed on stage (as a classical dancer), gazing up at the seating, despite the blinding spotlight, I could see the crowds, feel their gaze, their embrace, hear the thunderous applause, the appreciation of the performance and artistry, the acceptance into a family. There's no feeling in the world to compare it. How I miss performing. Now that we saw Nashville in the daytime, it was time to experience the downtown at night. So what do I wear--a Victoria's Secret sundress with cowboy boots. Yes I'm representing Miami proudly with a nod to Nashville. 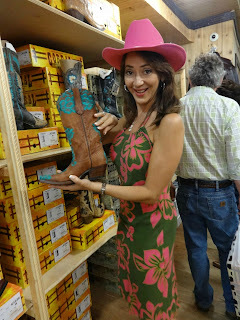 I even brought my cowgirl hat but Rachel wants to visit a souvenir shop and what do I find? 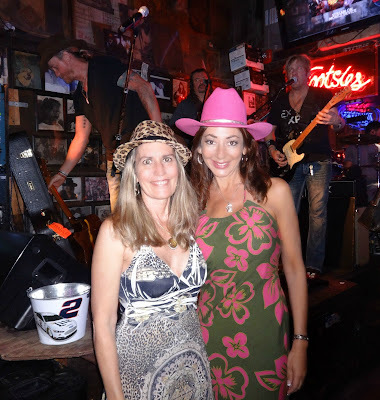 A PINK COWBOY HAT! Now I expect this in Miami, but did not expect it in Nashville. Of course I purchased it and wore it that evening. Why not?! 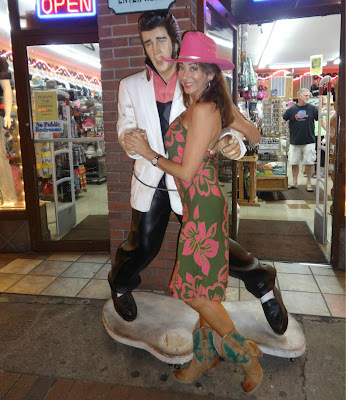 Of course who else do I run into outside the souvenir shop in Nashville, but Elvis! OK a wax Elvis. He wanted to dance. But of course! Ill let him lead. 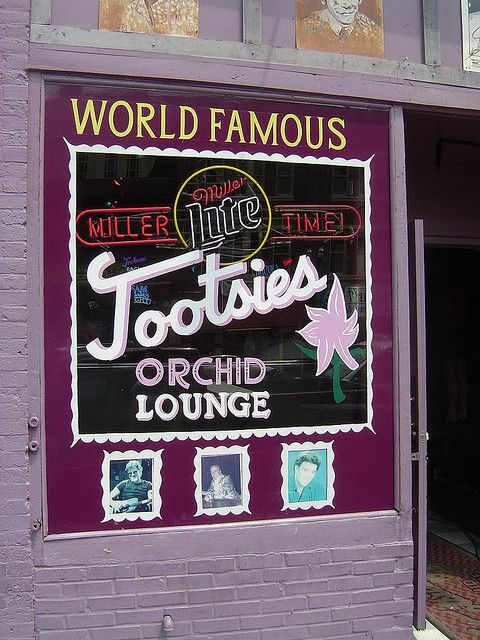 Now I was ready for Tootsie's the most famous dive bar in Nashville. 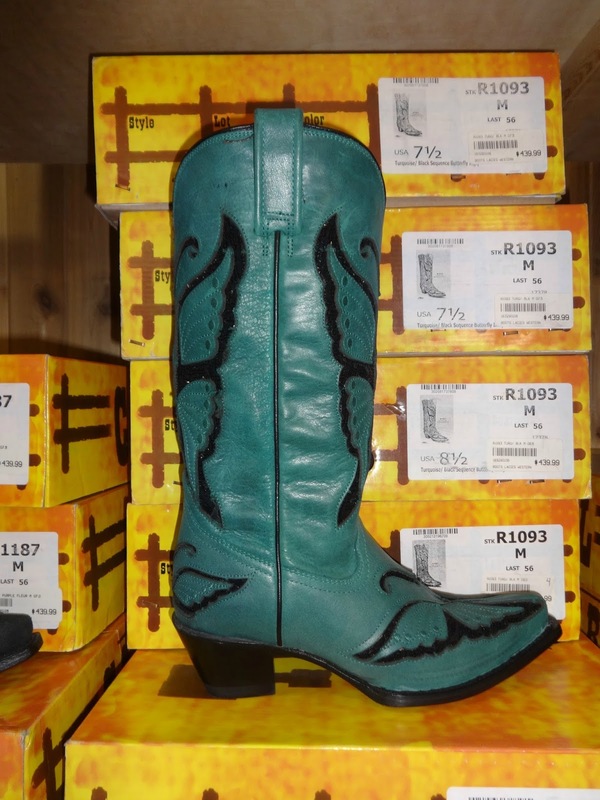 After one drink, the night is young, we stepped outside and headed left and came across a boot shop. Oooh I love boots. This could be very dangerous. Thankfully I have a strong will. 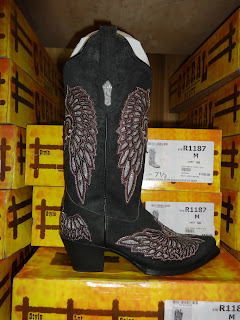 We found our favorite boots! 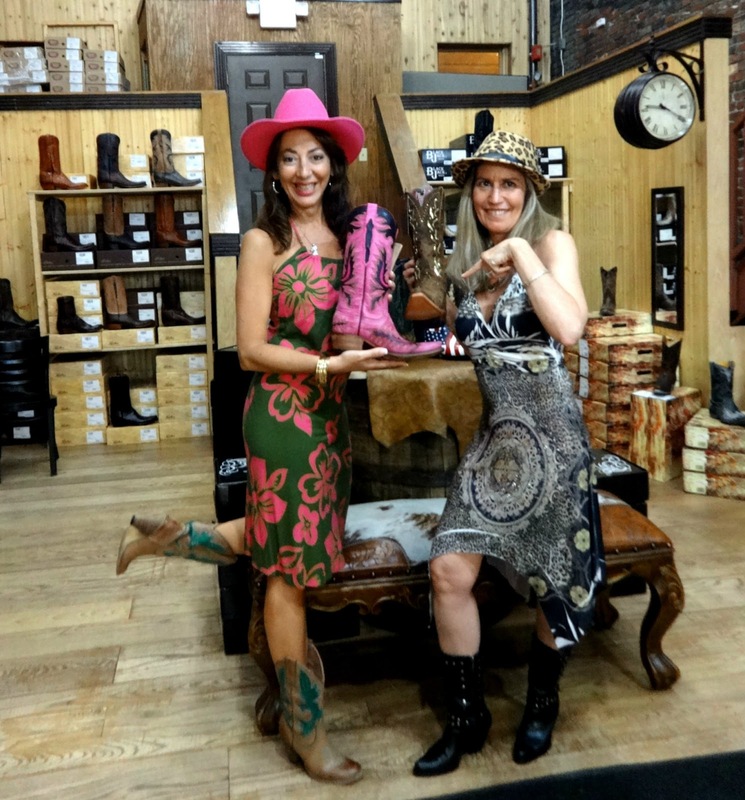 Mine has pink, Deb's boot has leopard design. After window boot shopping, hunger pangs struck and we headed to Ripley's for pulled pork with BBQ sauce and fries. When in Rome...Mouthwatering! As we headed back to pick up the transportation bus to our hotel, we passed several bars. We had a long wait for the bus and it started pouring rain. While we sought shelter under the overhang of a building, I could hear music playing across the street. I told the girls I would return in literally 15 minutes. But then I stayed. 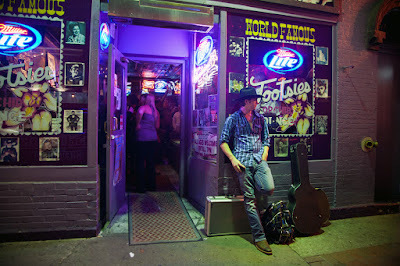 I was going to savor every sight, taste and sound of Nashville. For someone who doesn't listen to country music this band was great! What a great intro to Nashville for a brief three day conference. I will definitely be returning for more sightseeing and culture! 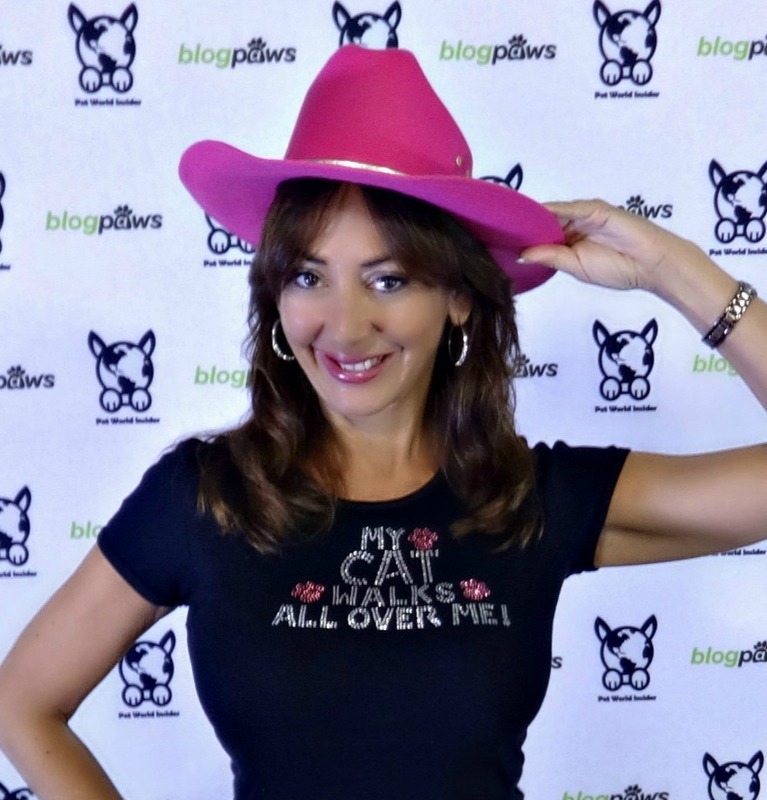 For an all around review of the conference, visit Pawsitively Humane. For a cat-centric review of the conference, visit Riverfront Cats. We welcome your comments to motivate our team. To leave a comment, click on "comment" below. Your comment will not appear immediately until approved by a moderator for possible spam. BRAND. So bachelors, don't be disheartened. There's still hope. (So who's the tall, dark handsome guy on my Instagram page? 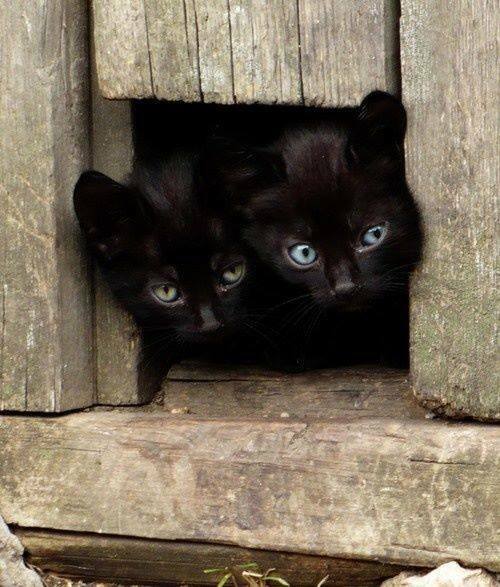 Stay tuned...) Now back to the matter at heart. I truly am inlove. Read on! While I am a loyal consumer, blogging about fashion brands is a rarity for me as I only select brands that offer high quality, parallel value, and creativity. Ted Baker fulfills all three tenets. But it's their marketing campaign that attracted me above all. 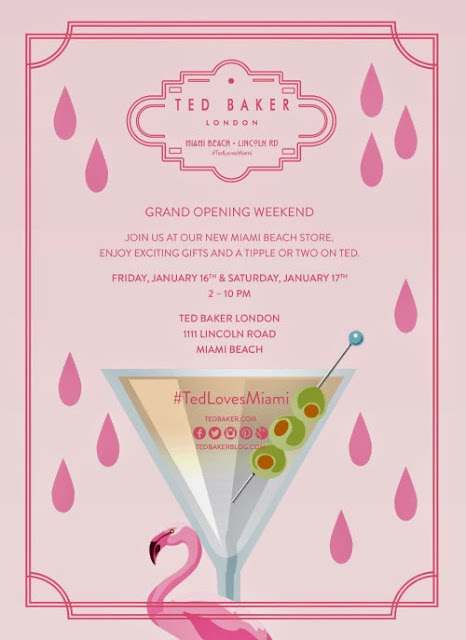 After following the social media hype leading up to the store opening, when invited to the Ted Baker pre VIP grand opening, I gratefully accepted. First a little about the night of the opening. 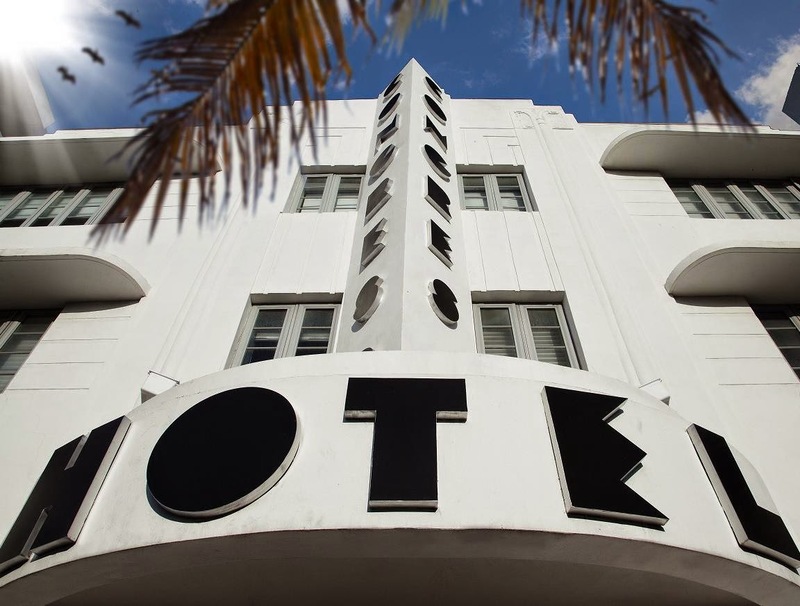 Ted Baker, from England, crossed the pond and made a splash at the lux Lincoln Road shopping promenade in South Beach. 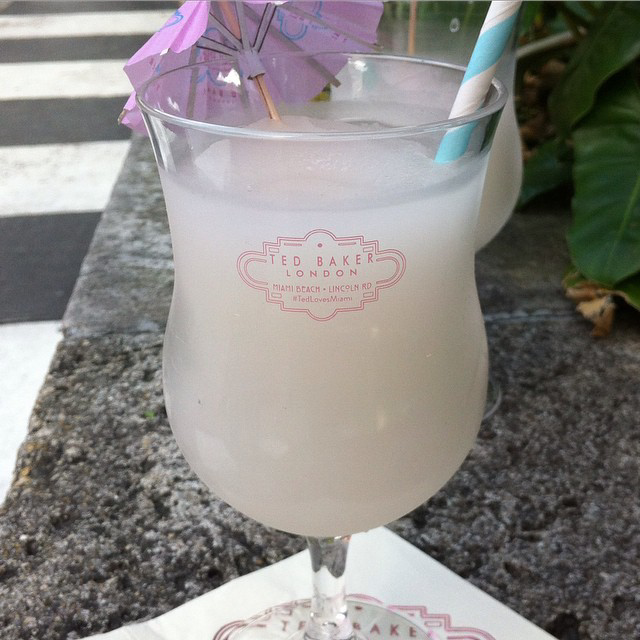 Ted, in following Roman tradition, served Florida classic cocktails and my all-time favorite, the pina colada. 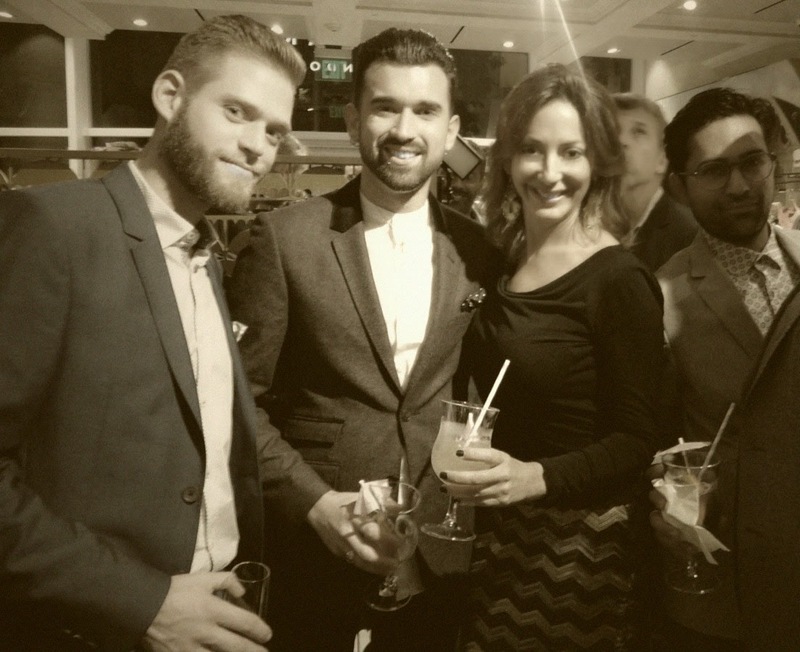 The staff and dedicated fans were dressed for the occasion in Ted Baker quintessential buttoned-up British fashion. My heart was aflutter when surrounded by men who looked like they took a time machine from the early 1900's in their #TedtoToe suits. Another clever marketing campaign by the brand. Attendees were encouraged to shop. No need to ask me twice! I immediately was drawn to a midi dress with vibrant print in pastel and bold colors bordered by black that swayed into the waist. While I have a small frame, I wondered if my curves would go against the style of the slim cut of the brand. Luckily with my medium height and dress size 4, the midi dress was ideal for me. After trying it on, I knew this would be my new go-to dress for occasions requiring Miami sophistication. Ted Baker is one of the UK's fasting growing leading lifestyle brands. The collection captures the heritage of British tailoring with a thoroughly contemporary outlook. Ted's approach is focused on an unwavering attention to detail and a firm commitment to quality with little touches that make Ted Baker products stand out from the rest. 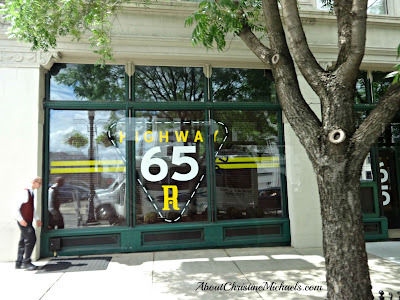 It originated with menswear and has branched out to womenswear and accessories. The incorporation of Miami colors and playfulness is ideal for the Miami fashionista for style and grace. Most impressive to me is their approach to marketing. While Ted Baker is a fictitious character, the personality of the brand, "refined by quirky", is that of the founder Ray Kelvin. Yes "quirky". We created a shirt that everyone in the country for some wonderful reason wanted to wear. It was during the period of Acid House and Garage, and they wore these bright acidy colour shirts. These particular shirts had a really nice soft feel. Even to this day I remember it. Whether intentionally or not, adding fuel to the eccentricity is the fact that very few have ever seen Ray Kelvin. He never shows his face in public. He considers himself "an ugly buggar". As if a commitment to quality, attention to detail, a memorable refined- but- quirky style, were enough attributes to set it apart-- It is not. The vision and discipline and creativity to leverage social media instead of traditional advertising campaigns is another ingredient to their winning formula. 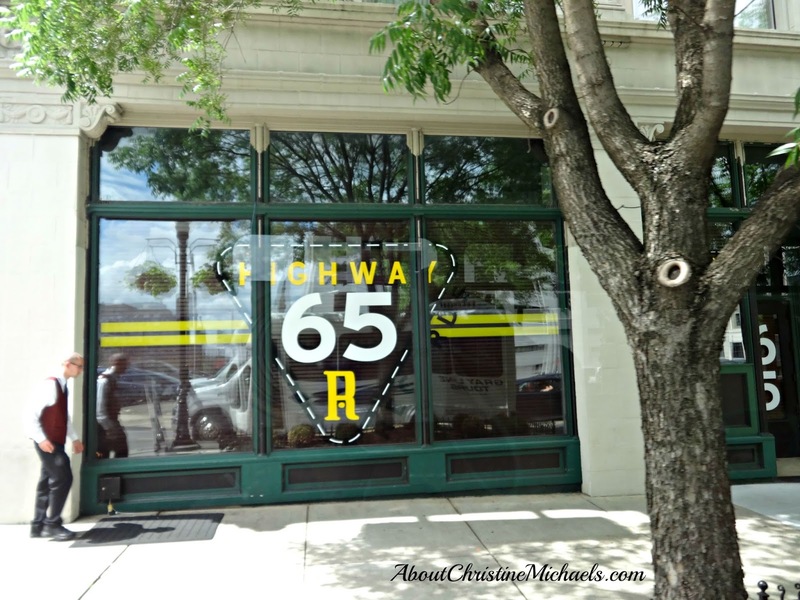 As a preacher and practitioner of this marketing philosophy, it's easy to follow as a small business owner. But a global brand reaching £700 million is unheard of. Simply GENIUS! Yes I'm inlove with Ted Baker branding. But most of all, the brand inspires me to keep charging forward with other innovative ideas. To view more photos of styles and dresses, click here for Krysha's Shopping Kapades blog post. To read about the VIP Grand Opening and the campaign leading up to the opening, click here for My Fabulous Florida blog post.